President Trump and Health and Human Services Secretary Tom Price visit Capitol Hill to rally support for the Republican health care bill. President Trump made the trip up Pennsylvania Avenue to close the deal with members of his own party on a bill that, on the face of it, does what Republicans have been promising to do for years: Repeal and replace the Affordable Care Act, also known as Obamacare. He came with a tough love message for members of his own party. "Looks like you'd be ripe for a primary if you don't keep your promise," the president told the group of lawmakers in a closed-door meeting, according to Rep. Blake Farenthold. "He did say that," the Texas Republican adds. Farenthold thinks Trump moved a handful of votes in what has become a narrow path to passage for a bill with Democratic and conservative critics. 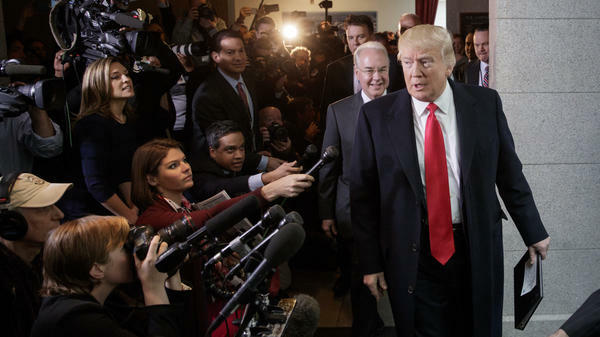 "Many of the people that were elected in that room were elected because of Obamacare, and so he was just being realistic," said Rep. Peter King, R-N.Y., explaining President Trump's pitch. In short, when Republicans didn't hold the White House, Congress voted dozens of times to repeal the Affordable Care Act, "and now you can't get it done. It will really make us look bad in the eyes of the public, and this unity we have now — House, Senate and the presidency — it could go down. We could lose in 2018," King said, paraphrasing the president. Trump reiterated that "the American people gave us serious instructions" during a fundraiser for the National Republican Congressional Committee on Tuesday evening. King, who still counts himself among the undecided, was singled out by the president in the closed-door meeting. It was friendly, he says, and possibly persuasive. "After he told everybody that he and I grew up near each other, it will be hard for me to vote no." They are both from Queens, N.Y. — Trump grew up in Jamaica Estates. King grew up in Sunnyside. "He was basically saying this is bad for the whole Republican agenda. If we don't make it on this one, which we spoke about so much, then it hurts us on everything going forward," said King. Most significantly, tax reform could be in jeopardy, something that congressional Republicans and the president have made clear they want to get to. Trump also called out Rep. Mark Meadows, R-N.C., the chairman of the far-right House Freedom Caucus. According to people in the room, Trump said, "Mark Meadows. I'm coming after you." Meadows did not take it as a threat. And he thinks if anyone can "bring this home and close out this deal," it's the president. But at the moment, Meadows remains a "no" vote, and while he refused to get into numbers, Meadows claimed there are enough people who agree with him to bring the bill down. The president, he said, "is aware of a vote count issue," and he believes Trump remains open to negotiating changes that could move people like Meadows to vote for the bill. At the White House daily press briefing on Tuesday afternoon, press secretary Sean Spicer said that Trump "continues to meet with members and walk away with a very, very optimistic view of where the bill is headed." Spicer also said he didn't want to "rule anything out" with regard to further changes to the bill. A Congressional Budget Office analysis found 14 million fewer people would have health coverage almost immediately if the GOP bill is passed, with that number rising to 24 million fewer people insured by 2026. It also found that insurance premiums would initially rise before falling by 10 percent in later years. It's the premiums that are giving Meadows pause, while for more moderate Republicans the concern is millions of people who would be without health care or would see their out of pocket costs increase drastically as less generous tax credits replace Obamacare subsidies under the GOP bill. Trump and House leaders are setting this up as a binary choice for Republicans: Do you want to keep Obamacare and break your pledge to your voters to repeal it? Or do you want to vote for this bill, which they admit isn't perfect, but which they promise will get better as the legislative process moves along, and which GOP leaders insist is far better than the Affordable Care Act. "President Trump was here to do what he does best, and that is to close the deal," said House Speaker Paul Ryan at a press conference after the meeting. "He is all in and we are all in to end this Obamacare nightmare." But a question remains. "All in" for what? As Trump left the meeting, he predicted, "We're going to have a real winner." But then he added, "There are going to be adjustments made, but I think we'll get the vote on Thursday." Already House leaders have introduced a series of amendments to the bill aimed at bringing on board reluctant Republicans. The amendments, announced last night, cut taxes on the wealthy that were put in place by the Affordable Care Act a year sooner, give states the option of imposing work requirements on able-bodied Medicaid recipients, and offer more generous reimbursement for elderly and disabled people on Medicaid (while still freezing and rolling back the expansion of Medicaid under the Affordable Care Act). It's unclear whether Trump is negotiating for additional changes now, as he looks to close the deal with House conservatives before Thursday's vote, or whether any changes would come in the Senate, which would take up the House bill once it passes, if it passes. "This is our chance and this is our moment," said Ryan. "It's a big moment. And I think our members are beginning to appreciate just what kind of a rendezvous with destiny we have right here."